The brighter orange planet is a global view of Venus made from a mosaic of radar images from the Magellan spacecraft. This computer-generated globe shows the planet from above the equator at 90 degrees longitude. 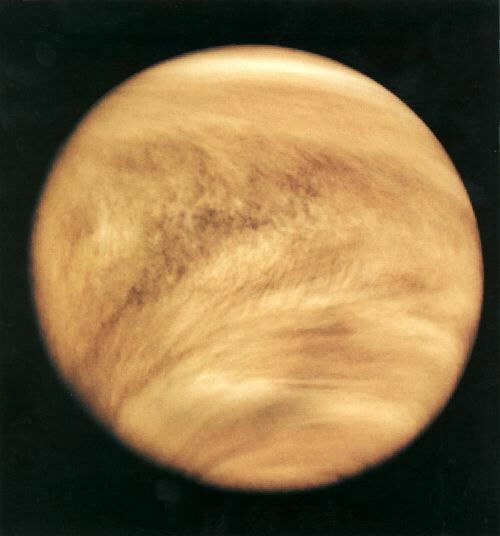 It shows the coverage of Venus during Magellan's highly successful first mapping cycle, completed in 1991. Magellan continued to gather data until October, 1994. On June 8, Venus will cross the face of the sun for the first time since 1882. There will be a repeat showing in 2012. After that, Venus won't pass directly between the sun and Earth until 2117. "There's nobody alive today that has seen it before," said Trey Goodman, manager of the Highland Road Park Observatory. "If you have the opportunity to see it now, you're going to see something that no other living person has seen. It's very unique." The best view on June 8 will be from Europe, where the entire six-hour transit will be visible. NASA is planning to do a live Webcast of the transit from Greece. In Baton Rouge, Louisiana, the transit will be visible for about 25 minutes, beginning at 6:06 a.m., Goodman said. The key to watching it, he said, is to find an unobstructed view of the horizon. The tree-line at the observatory will block the transit. It is recommended that you observe from the top of a high building. The transit will occur near the lower rim of the sun. The transit will be visible to the naked eye but it's not a good idea to stare directly at the sun. Use eclipse shades or a telescope lens filter. Aha! So we weren't so far out after all...Eyes will burn and tear if acid present. Advise soda bicarb solution [baking sods is safe in any dilution] on hand to neutralize sulphuric acid for skin and face. Eye wash as needed.. Avoid going outside, but cover skin and use gas mask if this can't be avoided Surgical masks not effective. Seal windows and doors in a safe room with duct tape. When the air gets stale after 5-6 hours, open up a crack here and there. Use a dilute soda spray bottle around openings. Have enough food and water on hand for 3-4 days. People with asthma, emphysema and bronchitis should seek a physician's counsel. Many of these sufferers will die if not protected. Scientists around the world are warning people to stay indoors for up to three days following the June 8 Venus Transit. The tail of Venus, which resembles that of a comet, will be blown in the direction of earth by solar winds as it eclipses the sun. The tail is comprised mainly of ammonia, sulphuric acid and other substances harmful to man. Doc, Saw this on GLP...no link though. Sulphuric acid fumes can burn the skin, cause blindness and lead to suffocation in people with compromised lungs. Experts advise that the whiplash effect of the tail on planet earth will subside after three days, making it safe to venture outdoors once more. Put a big red circle around June 8 on your calendar. On that day, you may have a chance to see a celestial event not witnessed by human eyes in 122 years when Venus crosses in front of the Sun. Venus has been growing brighter and climbing higher into our evening sky lately. It has evolved into an "evening lantern" for those commuting home from work and school. 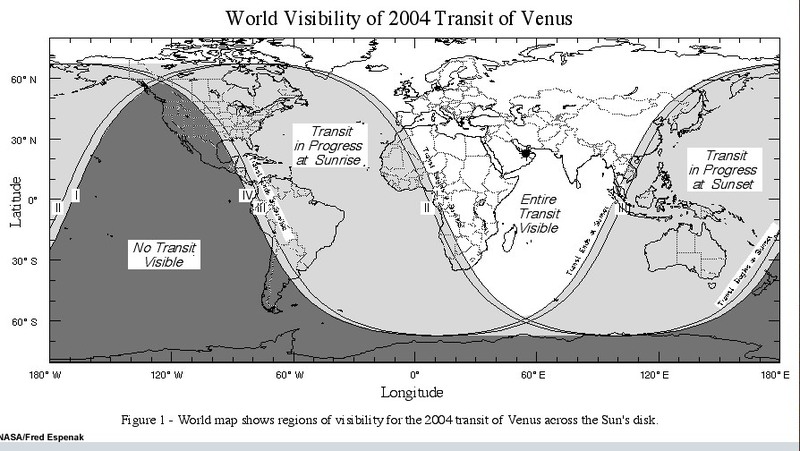 By the end of May 2004, however, Venus will be rapidly dropping back toward the Suns vicinity, ultimately to disappear as it makes the transition back into the morning sky. That transition day will be June 8. For on this Tuesday in June an Venus will making itself evident as a small black spot slowly moving across the solar disk. Portions of the hours-long transit will be visible from many locations around the world, including parts of Europe and America. Some folks will need to make travel plans, however, to see the show. This is among the rarest of astronomical events. In fact, between the years 2000 BC and 4000 AD there are only 81 Venusian "transits," as astronomers call them. Only five times have humans recorded the passage of Venus in front of the Sun (in 1639, 1761, 1769, 1874 and 1882), although its not impossible that a transit of Venus might have once been seen by chance in ancient times, near sunrise or sunset. Possibly on such an occasion, some ancient observer with a keen eye, viewing the Sun on an unusually hazy day, might have glimpsed our sister planet's dark image (reporting it as "a dark mark on the Sun") on the solar disk. Astronomer Joseph Ashbrook (1918-1980) wrote in "The Astronomical Scrapbook" (Sky Publishing Corporation, 1984): "For those who witness the transit of June 8, 2004, there comes the awesome thought that not a single human being remains alive that observed the last transit of Venus, in December, 1882." There is some neat math involved in Venus transits, all related to the predictability of its orbit, which is closer to the Sun than the annual path of Earth. The circumstances of the transits of Venus repeat themselves with great exactness after a period of 243 years. The intervals between individual transits (in years) currently go as follows: 8 + 121½ + 8 + 105½ = 243. In other words, a pair of transits may occur over a time span of just eight years, but following the second transit, the next will not occur again for more than a century. Transits of Venus occurred on Dec. 9, 1874 and Dec. 6, 1882. The transit this June is the first one since 1882, but the next will occur 8 years later on June 6, 2012, although this future event will be visible in its entirety only from the Pacific Ocean and the extreme east coasts of Siberia, Japan and Australia (North Americans will see the opening stages before sunset). Then it will be a long wait once again. On December 11, 2117, Venus will again pass in front of the Sun. Transits do not occur each time Venus passes from our evening to our night sky because things have to be lined up just right. When a transit occurs, the Sun, Venus and Earth are all in a direct line. But Earth and Venus do not orbit in exactly the same plane around the Sun, so often each planet is either above or below the location that would allow a transit. Think of it this way: Place two hoops on the ground to represent the orbits of the planets. Place a tennis ball in the middle as the Sun. Now lift one portion of one hoop a few inches off the ground. Only where the opposite side of the lifted hoop touches the ground can you imagine a line that connects all three objects. On June 8, the entire transit will last just more than six hours and will be visible in some form across approximately three-quarters of our planet. The beginning will be visible from northern and western portions of Alaska, all of Asia, Indonesia and Australia, the eastern half of Africa and northern and eastern Europe, as well as the northernmost parts of Greenland. The end will be visible over central and western Asia, all of Africa, Europe and Greenland as well as northernmost and eastern sections of North America and northern and eastern parts of South America. Australians will be able to catch the beginning stages before sunset. Europeans will be able to see most, if not all of the transit, starting at around sunrise with the end coming in the early afternoon with the Sun high in the sky. For much of the eastern United States and Canada, the Sun will rise with Venus already on the Suns disk with the transit nearly over. Unfortunately, those living across the western United States and Canada, as well as Hawaii, will be precluded from seeing any part of this spectacle, as the Sun will be below the horizon when it takes place. Transits of Mercury are more common. One occurred last May. But Mercury transits are difficult to notice because the planet is so small and far away. Venus is closer to Earth and larger. Venus transits are readily visible without telescopes or binoculars, but proper protection must be employed. Never look directly at the Sun, or serious eye damage can result. Viewers should use special, approved filters that can be purchased from reputable dealers of astronomy products. Other tricks can be employed, such as pinhole cameras or simple projection methods, to indirectly and safely view the Sun. When Venus is in transit across the solar disk, the planet appears as a distinct, albeit tiny, round black spot with a diameter just 1/32 that of the Sun. This size is large enough to perceive with the unaided but properly protected eye. Editor's Note: SPACE.com will provide more detail on the great Venus transit of 2004 in the weeks leading up to the event. On June 8, 2004 Venus will be at inferior conjunction to the Sun, or between the Earth and Sun in a similar configuration to a Solar eclipse. For a little more than six hours, Venus will be seen to cross the lower limb of the Sun from the Earth. Astrologically, Venus will appear retrograde from the Earth at 17º Gemini (Tropical) or 23º Taurus (Sidereal), and her Solar crossing will take place against the backdrop of the constellation Orion, the warrior. Of great significance is that this event provides the only opportunity to view the atmospheric ring of Venus, where the light of the planets surface will be visible. When Mercury transits the face of the Sun, he appears as a black dot moving across the Solar orb, while Venus will feature a halo of light around her dark edge. No one alive today has seen this phenomenon. The transit will be entirely visible in the Pacific rim nations and in the northwest area of North America. The first visibility will take place at sunrise on the tip of South Africa. A map is available in PDF format from the U.S. Naval Observatory. What occurs during the period between the eight-year transit pairs is undoubtedly more significant than the events themselves. Those with historical and metaphysical insights will note that intense periods of social and religious enlightenment took place at these times, which set into motion long-lived institutions for justice, social equality, and the eradication of disease. In the realm of spirit, these periods also set the stage for intracultural discourse on spirituality and the dissemination of ancient knowledge. In the sacred astronomy of ancient Egypt, Venus as the morning star represents the ascent of Maat, goddess of truth, in the celestial barque of her father Ra. As the evening star, she signifies the descent of Hathor, one of the goddesses in the afterlife who enters the Duat or invisible region of the sky where she welcomes departing souls. There have been 52 transits of Venus across the Sun between 2000 B.C and 1882 A.D. Humans could only have noticed this event if they were watching the sun near the horizon at exactly the right time. There are no historical records that suggest anyone was so lucky prior to 1639, although Montezuma may have spotted the 1520 transit while studying the Sun for portends. The Mayan civilization had a particular fascination with Venus because it was associated with their chief god Quetzalcoatl and one of his incarnations, Kulkulkan. Galileo Galilee in 1610 was the first human to actually see Venus as more than just a bright point of light in the sky. Johannes Kepler, meanwhile, was shaking up the world by his meticulous use of astronomical data assembled by Tycho Brahe. What he discovered during these laborious hand calculations was that Venus would pass in front of the Sun on December 6th 1631, but the transit was not visible from Europe at all. There is no known sighting of this transit in recorded history until the British Cleric, Jeremiah Horrocks and his friend William Crabtree spotted it on December 4, 1639, and that is only because Horrocks had mathematically predicted this transit using better data than Kepler had used. Here is what Horrocks had to say about the transit. rippled. Yellowstone had blown up. Spring is almost here, and with it comes a strong wave of energy. There is always an energy wave that comes to Earth at the time of the Spring Equinox. This year the wave will start on March 13, and will continue until the new moon of April. We have readied the mid point of the seven-year tribulation period that started on September 13, 2000. From this time forward, the Earth will go through major changes. I have a book called The Nature of Reality which was written, or channeled, by Hilarion and published in 1978. This book says that in the midst of the tribulation, a number of natural catastrophes will be arranged to afflict the Earth. One of the most frightening of these catastrophes will be the discovery that a large asteroid will collide with the Earth and will be felt throughout the world as a tremendous shock-wave, initiating earthquake and volcanic activity on a scale unheard of in the written history of man. Anyone hear David Booth on Coast to Coast Monday night February 23? He says a planetary object will pass by the South Pole sometime this year and will cause a shock wave around the world. David also says that this spring will bring to the Southern Hemisphere an incredible once in a lifetime event with the passing of Comets 2001Q4 NEAT and 2002 T7 LINEAR. Perhaps more interesting though is that the point of crossing for these two comet's occurs by the star Sirius. Sirius is the largest and most brilliant star in our heavens. It is known as the Dog Star and is 8.6 light years from Earth. It is visible in the Northern Hemisphere evening sky from November through April. An ancient Hopi prophecy states, "When the Blue Star Kachina makes its appearance in the heavens, the Fifth World will emerge". The Blue Star is Sirius. And soon, very soon afterward, Pahana (Christ) will return. Perhaps more ominous though will be that these two comets will form an X, or cross, directly under the Earth over the south pole at almost the same time Venus begins eclipsing the Sun on June 8, 2004. Venus is the ruling planet of the Mayan Calendar and signifies a very important time period. The Mayans look to this time period as the return of Quetzalcoatl, also known as Jesus. I received an email from Carl Johan Calleman, who wrote an article about the passage of Venus. To read this article, go to www.OnenessCelebration.com. He says, "To become real, the energy of Quetzacoatl must manifest in human beings. At this time this must happen through the absorption of the energy of light on the right brain and unifying this with the left. This is really about activating Kundalini energy for which humanity is now ripe. This is a winding energy of light in our bodies, a manifestation of the movement of the serpent of light". Another interesting event is that Supernova 1987 has become a raging ring of fire. This Cosmic Pineal has caught on fire. As above, so below! The Astronomers expected this to happen in 2005. It is happening now, and we will soon feel our Kundalini rising, and our bodies will fill with light. To obtain more information on this, go to the web site www.HiddenMeanings.com. The book, The Nature of Reality, and the Bible states that it's now time for the SE Asian countries to come into the act with war and aggression. This could be either North Korea, China, or Taiwan. It's time for the Kings from the East to play their part. This book also says that before the march of the Chinese army has been completed, there will be a great storm over the entire world, which will be caused by the Earth passing through a cloud in space which contains harmful chemicals, hydrocarbon materials, debris and larger pieces of solid material. The hydrocarbons will ignite in the higher levels of the atmosphere and produce smoke and other products of combustion which will greatly cut down the amount of light that the Sun and Moon give to the Earth. The burning of the hydrocarbon gases will produce a terrifying display for all to see and will convince many that God is real, and that the final days have come. The Bible says in 2 Peter, chapter 3, verse 10, that the day of the Lord will come like a thief in the night, and then the heavens will pass away with a loud noise, and the elements will be dissolved with fire. Then we will have a new heaven and a new Earth in which righteousness dwells. The Nature of Reality book says, "Prior to the passage of the Earth through the cloud in space, a great sign will appear in the heavens, to indicate to those who have realized the truth, that the last days have come. This is the sign of the Son of Man spoken of in the scriptures. It will be constituted by a comet (or comets) whose tail is divided into a couple of spikes or fingers extending in different directions. Those finger's as seen from the direction of the Earth will exactly form the Greek letter Chi, which is an X or the word Christ". I believe this is what David Booth is talking about. The Southern Hemisphere will start seeing the comets soon, and by the end of April they will be at the closest point to Earth. The comets will be in the heaven during the Easter season, which to me represents the risen Christ. It's time to manifest the golden light of the Christ that is within all of us. The planets are very stressful in April. Toward the end of the month, the planet Mars with be opposing Pluto, with the moon making a 90 degree angle to those two planets. This is a very fiery, violent, explosive, energy. The whole world will feel the explosive aspect of this energy. The areas most likely to be affected are the Yellowstone area, Afghanistan, Pakistan and India. This could also affect Mexico. This explosive energy will come back even stronger in September. The book goes on to say that those who fail to understand and heed the meaning of this sign in the heavens will not be able to escape the final period of the Tribulation. This means to choose love in your heart instead of anger, violence and hatred. Up to the time of the appearance of these comets, all of those who earnestly and with their whole heart change their old ways and take up the cross of service and dedication to their fellow man will become entitled to what the Scriptures call the Rapture. The Rapture is essentially an escape from the horrors of the Tribulation to a place of safety where those who have assembled can work and learn in order to prepare themselves for the new world. The Rapture can work out in different ways. The Bible says we rise to meet the Lord in the air. This could mean being beamed onto a ship or a raise in consciousness into a higher dimension. However you perceive it, that's how it shall be. This book also says that after the sign of the cross (X) in the heavens, there will arise a great wave of religious zeal, which will burn like a flame in the hearts of its new converts. This religion will be the seed of a new Universal Faith for mankind in the years following the tribulation. First, there was the book, the De Vinci Code, by Dan Brown, which is about Mary Magdalene. She is the Virgin Goddess, or connected with the sign of Virgo. All of the Temples in France are dedicated to Mary Magdalene, and the temples are built in such a way as to form the symbol of the sign Virgo. Now there is the movie The Passion. It is hitting the world like a steam roller. The movie was released in the sign of Pisces. The planets signify religious zeal because Uranus is in Pisces and it will remain there for seven years. Pisces rules suffering, both emotional and physical. It signifies a suffering Messiah, thus the movie and the cross in the heavens. Don't you think it's time to take Jesus off the cross and honor him as the risen savior? The Bible says that Jesus (Yeshua) was the Lion of the Tribe of Judah. The Lion signifies the sign of Leo, which rules the heart. He gave us one commandment, which is to express unconditional love. He was born a Leo in the age of Pisces. Regulus, the Royal Star of the Lion, has been moving through the sign of Leo for the last 2,160 years. Now it is on 0 degrees Virgo and in the transition stage to the feminine energy. The mirror image of Pisces is Leo. The mirror image is experienced by being six signs away from each other like Pisces/Leo - Aries/Virgo - Taurus/Libra, etc. We have been in the age of Pisces/Leo. The Pisces influence has brought us much suffering until we can open our hearts to experience unconditional love. The Leo energy rules kings and queens. England's symbol is the Lion. Now we are in the goddess energy, which started in July of 1991. This is when we first started experiencing the energy of Virgo. The mirror image of Virgo is Aquarius. Now we are in the transition stage of blending our male and female energy into one. This will happen during the time period of Uranus moving through Pisces. In 2010 Uranus moves into Aries, and we start a whole new cycle. We are also moving from a 26,000 year cycle of Capricorn (materialism, structure, and control), into the Age of Aquarius ruled by Uranus. Tenth level light body is associated with Capricorn, and rules body pain such as knees, bones, dizziness, stomach pain, blurred vision and headaches. Aquarius roles eleventh level light body. It also rules light, freedom and the Golden Age. We first started feeling the effects of this sign in February of 1962 when most of the planets lined up in Aquarius. Remember the song, This is the Dawning of the Age of Aquarius. We have been moving into this age of freedom for a long time. Now, it's time to start manifesting that freedom. Remember, there is a world of light that is overshadowing this world of darkness. Those who are ready will soon be living in the world of light, and will be through experiencing pain and suffering. > The mirror image of Pisces is Leo. The mirror image is experienced by being six signs away from each other like Pisces/Leo - Aries/Virgo - Taurus/Libra, etc. We have been in the age of Pisces/Leo. The Pisces influence has brought us much suffering until we can open our hearts to experience unconditional love. The Leo energy rules kings and queens. England's symbol is the Lion. The opposite of Pisces is Virgo, not Leo and the opposite of Libra is Aries etc... which kind of messes up Mahala's symbology. The transition into Unity consciousness could be turbulent. As old structures of human consciousness collapse, it may be accompanied by a degree of darkness and destruction. This process should be seen in proper perspective. “When the light hits”, as Jose Arguelles, puts it, “the dark gets tough”! This current “doorway of Venus” is especially significant because it remains open until 2012 AD, the completion our current cycle of human evolution. Some refer to this date as the end of linear time, or as the end of a period of human consciousness conditioned by separation and duality. The Mayans refer to this time as the Return of Quetzalcoatl, the Plumed Serpent, and look to this eight-year doorway as the timeframe within which the mass enlightenment of humanity will take place. June 6-8 is being promoted worldwide as the Call for Global Oneness. Let us come together during this time in gatherings throughout the world to celebrate love and beauty, light and unity. Let us work with these expansive cosmic energies to anchor them deep into the heart of Earth Mother, deep into the human collective consciousness. Let us translate these energies into art, economics, culture, politics, education and ecology. Let us bring transformation into every field of human endeavor. Let us pray, each in our own way, for peace, healing, beauty, and enlightenment for all! We will continue building the momentum on this same day year after year for the next eight years until June 6, 2012. Please network this widely. Please link up to www.experiencefestival.com/venus_transit for suggestions on what you can do, for further information on the Venus transit, to publicize any events you may wish to plan, or to receive information on events in your local area (after April 12, please see www.globaloneness.com). This will be a continually updated interactive website, and your input is welcome. We are inviting spiritual teachers from every religious faith, indigenous elders from every tradition, healers, artists, musicians, dancers, networkers, and organizers to join with us in co-creating the biggest spiritual event in human history. As we move into this 3-day global festival, we will be broadcasting live streaming images from Oneness Gatherings around the world. Let us participate together to co-create heaven on earth! - Europe's first space probe to Venus was launched on Wednesday on a mission that aims to shed light on Earth's closest planetary neighbour and give scientists clues about global warming. Among the riddles the mission hopes to solve is why a planet so similar to Earth in size, mass and composition has evolved so differently over the last 4,600 million years. Here are some key facts and differences between the two planets. Venus is often referred to as Earth's sister planet because of similarities in size, mass, density and volume. It is believed that both planets share a common origin around 4.5 billion years ago. Venus, the second planet from the Sun, lies, on average, 108 million km from the Sun, about 30 percent closer than the Earth. The surface of Venus is the hottest in the solar system at 477 degrees celsius. The high temperatures were caused by teh greenhouse effect of a carbon dioxide-rich atmosphere. Sunlight is trapped by the atmosphere and cannot radiate out into space, with a resulting boost to the surface temperature by over 202 degrees centigrade. The Russian Venera landers touched down in the 1980s and survived for about 60 minutes during which time images were taken which revealed a barren world. The planet consists of vast plains covered by lava flows and mountainous regions. Impact craters cover the surface. Unlike other worlds, however, there are virtually no craters less than 2 km in size. The impactors that would cause them simply burn up in the thick atmosphere. Those that do exist are believed to be caused by the fragmentation of a large meteorite just before impact with the surface. Scientists are especially intrigued by the dark vortex shown almost directly over the south pole, a previously suspected but until now unconfirmed structure that corresponds to a similar cloud structure over the north pole. "Just one day after arrival, we are already experiencing the hot, dynamic environment of Venus," said Dr Hakan Svedhem, Venus Express project scientist. "We will see much more detail at an unprecedented level as we get over 100 times better resolution as we get closer to Venus, and we expect to see these spiral structures evolve very quickly." The initial, low-quality images were taken from an extreme distance of 206,452 kms from the planet, yet caught scientists' attention, particularly with the surprisingly clear structures and unexpected details shown in the VIRTIS spectrometer images. The false-colour VIRTIS composite image shows Venus's day side at left and night side at right, and corresponds to a scale of 50 kms per pixel. The day half is itself a composite of images taken via wavelength filters and chiefly shows sunlight reflected from the tops of clouds, down to a height of about 65 km above the planet's surface. 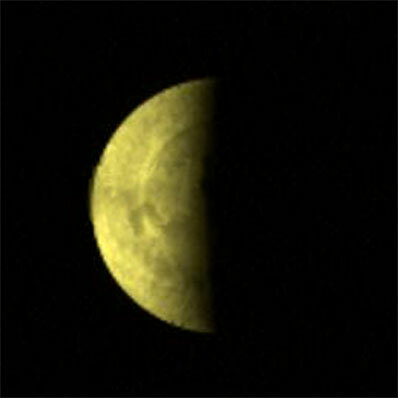 The smaller VMC image shows Venus at a scale of 150 kms per pixel and is also shown in false colour. It was recorded in ultraviolet. Venus Express fired its main engine to enter Venus orbit on 11 April 2006 and is now in the first 9-day capture orbit taking it to apocentre (maximum height) at 350,000 kilometres below the south pole. It will swing back up to pass pericentre (minimum height) at an altitude of 250 kilometres over the planet's north pole. In the first capture orbit, Venus Express will have 5 additional opportunities for gathering data until reaching pericentre. These observations represent a great opportunity because, at apocentre, the full disc of Venus is fully visible for the spacecraft's imagers. Such opportunities will not occur again during the nominal mission, starting on 4 June 2006, when the range of distances from the planet will be much smaller. In addition to VMC and VIRTIS, the spacecraft's MAG (Venus Express Magnetometer) has been switched on for initial verification and is operating nominally. Together with the ASPERA (Analyser of Space Plasma and Energetic Atoms), the two instruments are expected to gather information about the unperturbed solar wind and the atmospheric escape processes on Venus, a planet with no magnetic protection. A series of further engine and thruster burns are planned to gradually reduce the apocentre during the following 16 orbital loops around the planet and the spacecraft is due to attain its final 24-hour polar orbit on 7 May, ranging from 66 000 to 250 kilometres above Venus. Eons ago, Venus may have been the gentle, tropical paradise that Earthlings once imagined. It was closer to the sun — but not too close. It was almost Earth-size — but not quite. And it had plenty of water, even oceans. But that was then. Sometime in the distant past, the oceans started to heat up and then boiled away. The water vapour hung over the planet like a glove, trapping the heat below and creating a berserk greenhouse effect. Today, Venus' atmosphere is 97 per cent carbon dioxide, and the planet is wreathed in clouds of sulphuric acid. The planet is apparently condemned to an eternal cycle of global warming, with surface temperatures that hover around 480C. There are, perhaps, lessons to be learned here. "Venus is very unpleasant," says Hakan Svedhem of the European Space Agency. "We know the greenhouse effect on Earth is a very interesting topic. Maybe with Venus, we can better understand how our own atmosphere works." On Tuesday, ESA's Venus Express, a honeycombed aluminum spacecraft carrying seven instruments and cloaked in a metallic gold polymer to fend off the heat, successfully completed a 51-minute rocket burn that put it into an elliptical polar orbit. For the next 500 days, with the possibility of extending for another 500, the spacecraft will probe mysteries that have confounded and fascinated scientists since exploration of the planet first began with NASA's Mariner 2 in 1962. Chief among them is what happened to turn Venus into a child's vision of hell, with a superheated toxic soup of an atmosphere that is about 90 times denser at the surface than Earth's — about the same pressure as the ocean at a depth of nearly a kilometre. NASA's Magellan mission, which ended in 1994, used radar to penetrate the cloud cover and map Venus' tortured surface, paved with lava flows and pocked with craters and volcanic mountain escarpments. Venus Express, by contrast, is "geared toward a very detailed study of the atmosphere," says ESA's Don McCoy, the project's manager. There is a lot to understand. Measurements taken by early probes of Venus have made scientists all but certain that the planet once had extensive oceans that heated up and finally boiled off. Quite probably the resulting cloud of water vapour provided the initial atmospheric blanket that turned the planet into a hothouse. "But where did (the water) go?" asks University of Michigan planetary scientist Stephen Bougher. "Nobody knows." Heat could break the water into its constituent atoms, and the hydrogen could easily evaporate from the upper atmosphere and escape into space, but "something different" had to have happened to the heavier oxygen, Bougher says. One possibility is that a magnetic field induced by the solar wind may have swept charged oxygen particles away from the planet, he says. Venus Express has an instrument that can measure atmospheric erosion and perhaps provide data that will help scientists reconstruct how Venus lost its oceans. Over time, carbon dioxide replaced the water vapour, probably as a result of the erupting volcanoes that resurfaced Venus about 700 million years ago and spewed clouds of sulphurous gas into the atmosphere. Venus Express will search for traces of sulphur dioxide, an indication that volcanoes have been recently active. Scientists may also be able to deduce whether volcanoes are still erupting by using the spacecraft's infrared camera to penetrate the atmosphere and take pictures of Venus's surface. "By correlating these images with the Magellan data, we can tell whether vulcanism today is altering the landscape," says NASA scientist Adriana Ocampo, the agency's liaison with Venus Express. "This is a key question for Venus, and could be important in understanding climate change on Earth." Another puzzle that has mystified scientists for decades is Venus's winds, which are negligible on the surface but reach speeds of about 350 km/h in the upper atmosphere, much faster than the planet rotates. "There is no reason for the wind," says Svedhem, lead scientist with Venus Express. The spacecraft will measure wind speeds at various altitudes and correlate them with temperatures. The spacecraft will also gather data on the whirlpool-like atmospheric vortices at Venus's poles, another phenomenon that has no explanation. The $305 million Venus Express launched from Baikonur Cosmodrome, in Kazakhstan, on Nov. 9 last year. It was modelled on ESA's Mars Express, currently in orbit around Mars, and has some instruments that are identical to those on both the earlier spacecraft and on Rosetta, an ongoing ESA mission to a comet. But unlike Mars Express, built to absorb warmth from a distant sun, Venus Express must shed heat. Besides its reflective coating, it has solar panels that are tiny, compared with those of Mars Express, and half the panels are mirrors. Getting electricity to operate the spacecraft, "is one of the easier aspects of the mission," McCoy says. Venus Express weighs 1,200 kilograms fully fuelled and travelled about 400 million kilometres to reach Venus. It was moving at a speed of 28,800 km/h relative to the planet but slowed by 15 per cent of its velocity so it could be captured into orbit. The initial ellipse extends from 248 kilometres above Venus' surface to 328,000 kilometres away, and the spacecraft will need a few more days to complete an orbit. McCoy said engineers will tighten the ellipse to a maximum distance of 65,000 kilometres with two more rocket burns and settle into a 24-hour orbit in about two weeks. Starry Night software brings the universe to your desktop. Map the sky, or just sit back and let the cosmos come to you.